PORTEmaus: Want a Glimpse of a World Devoid of Men? Check This Series Out. Want a Glimpse of a World Devoid of Men? Check This Series Out. With all of the talk about the end of the world and comics, I would like to discuss a series that has a mixture of both. Also, for those waiting for the Hemingway, I meant to take it to Chicago with me but it seems that I lost it. Which is odd considered how I treat my books, lets just deem that a lost cause and move on. I do not consider myself superstitious, yet I actively engage in one superstition. No, I do not carry a rabbits foot or throw salt over me shoulder... It is far nerdier than that. Ever since I first flew on an airplane, I have always had comics with me and I will not board a mechanical bird without them. 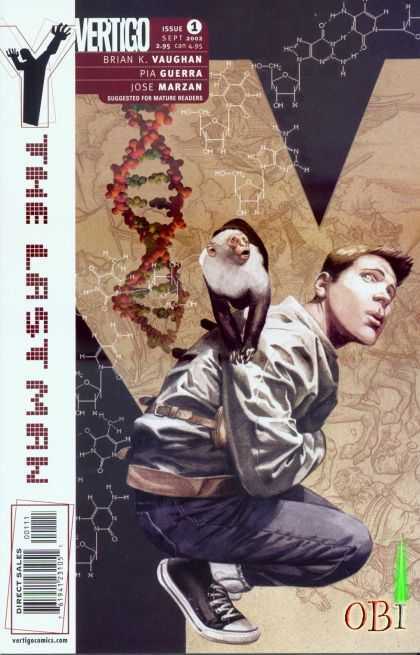 On the aforementioned flight, I brought some trades among which was the third deluxe edition of Y the Last Man. I have since finished the fourth and the fifth or in other words the series. There is much ground to cover regarding this series, I hope that I can do it justice. Without exception, Brian K. Vaughan is one of the best talents in comics today. He does not have recurring third act issues like Morrison (Seven Soldiers may change my stance on Morrison) and he has a refreshing approach to character dialogue (intelligent and pop-culture referential). I read the first trade in 2004, partly because of the concept but also because it was recommended. Thought it was a great idea and then never really followed up with it. 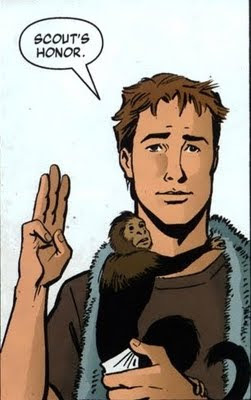 This is the story of magician Yorick Brown, his capuchin monkey Ampersand and a little event concerning the extinction of anything with the Y chromosome (including plants, sperm and embryos) save for those two. I know you all feel a crack coming on about a world full of women and the shenanigans which would come from such a situation but I will refrain. Through the course of sixty issues, you follow Yorick, Agent 355 (a secret agent protecting him) and Dr. Allison Mann (she might be the key to reversing the extinction of the male gender) as they attempt to transverse the world to unlock the key of the gender plague and reunite Yorick with his girlfriend, Beth. I know what you are thinking... Wow, we have heard this kind of story before. Yet, it is the attention to detail, Vaughan's dialogue and the characters that make it better than similar stories. I was fearfully that once the revelation of what caused the plague would be a letdown. I was not though, it was altogether satisfying. I would love nothing more than to go through the series over the course of a couple entries but much like Gotham Central, I think that people should read it for themselves. Much like GC, Y The Last Man would make a fantastic film or very expensive television show. It kind of made reading difficult to read because I kept thinking about how I would write or shoot specific scenes... Thanks, junior college production courses. For those interested, New Line wanted to make a movie based on the series. You will notice I said movie as in one... To cover the entire series. This is ridiculous considering the wealth of ideas to draw from. Interested director, DJ Caruso felt the same way as he wanted to do three films and New Line Cinema balked. So, no movie for now. Comics or funny books get a bad rap in our society. They are simply considered flights of fancy. 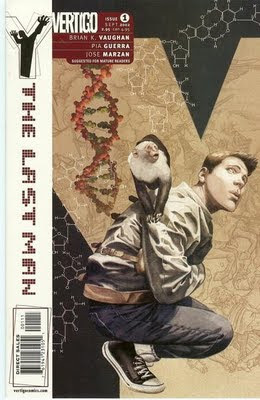 This is kind of depressing since it means that many people would not read Y The Last Man because of this fact. Let the story do the convincing... You will not be disappointed. Plus, it has one of the best finales in comics... It is reminiscent of the ending to Six Feet Under... Arguably, the greatest finale in television history. Take that M*A*S*H.
Wait until you get to the end of it... I sat there and thought "damn it is over" for a ten minutes. Then I went to bed. Lol... I do not think it wiped out the transgendered and you might be on to something with Lady Gaga would have cut the need for 30 issues. Then again 2002 was a simple time where she did not exist. Those were the days.